Ken Adam did not have any access to, nor had ever been inside a Boeing B-52 when he began his production sketches for Dr. Strangelove’s bomber cockpit. 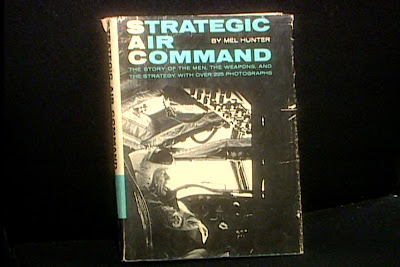 Instead, Adam relied on a copy of Mel Hunter’s Strategic Air Command: The Story of the Men, the Weapons, and the Strategy (1961). Hunter, an illustrator for pulp science fiction novels, included photographs and drawings of Air Force aircraft and equipment in his book. However, the only picture of a B-52 cockpit was on the cover of Strategic Air Command. Using the cover as an inspiration, Adam and the rest of the production design team created a makeshift bomber cockpit. 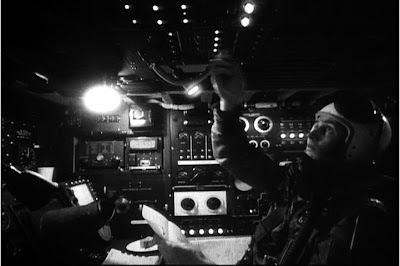 In Dr. Strangelove, Slim Pickens and James Earl Jones occupy a space crammed with radar scanners, avionics, and communications equipment. Like his Typhoon cockpit, Adam’s design for the dual-level B-52 crew compartment is a womb-like space with hundreds of dials and levers – an intimate, cramped space. The top compartment features the pilots and flight engineers/navigators. When filmed from a vantage point behind Slim Pickens’ command seat, the set indeed looks like the cover to Hunter’s Strategic Air Command. The lower part of the crew compartment, housing armorers and radar observers, is cramped. Other than the light emanating from the instrument panels, here, the only source of direct light comes from a series of halogen lamps as well as the open hatch connecting the top and bottom compartments. Like the computer room at Burpelson Air Force Base, this space is also connected to General Ripper’s office. It is here, after all, that Ripper’s own command is executed: the wing attack plan “R for ‘Romeo’” (or “Robert”). The rote operations of nuclear war, whether launching of a ballistic missile or arming warheads aboard a bomber, invoke a terrifying sequence of events. The architectural loci of these events create a series of operational, physical terrains that have become part of our visual culture: concrete bunkers, bristling with telemetry screens and other types of graphical user interfaces (GUI’s); weapons consoles inside nuclear submarines navigating the Arctic depths; claustrophobic cockpits of Boeing or Tupolev bombers en route to a launch point miles above the Earth’s surface. We know these places through the books, movies, and television programs that have popularized them. Thus, the procedure of arming nuclear ordnance in mid-air is one that has become part of our collective imagination not because we have actually flown inside a B-52 Stratofortress, but because we have seen Slim Pickens and James Earl Jones perform the same procedure in Dr. Strangelove. One readily thinks of Marshall McLuhan’s theory of remediation, where one medium determines the content of another medium. Thus the radar screens and GUI’s of the Cold War become the storylines of our popular media. We watch with anticipation as digitized icons representing ships, submarines, and aircraft play out their kriegspiele on the television and movie screens move and destroy each other before our eyes. 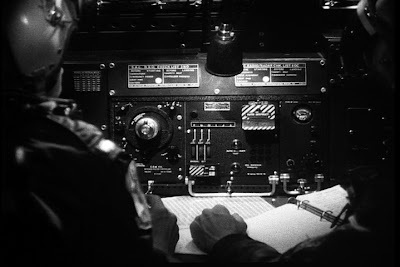 The way directors and writers choose to depict the launching of a nuclear weapon in movies and TV may not be accurate, but at the very least, they share one trait in common: they present soldiers inputting a series of codes into their computers that initiate the ignition and launch of a missile. Here, then, is a typical scene. A commanding officer receives a telephone call with a specific code word, which he communicates to his launch officers. They, in turn, consult some heavy tomes containing alphanumeric codewords, words which are printed in a strange manila folder containing the launch keys. Another group of launch officers then simultaneously insert the keys into another console, and after turning the keys in unison, the point of no-return – a computer begins the countdown to launch and nuclear annihilation. 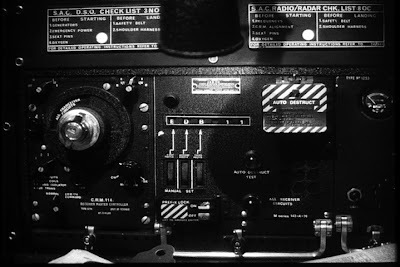 CRM signal displays code for "Plan 'R' for 'Robert'"
This process also unfolds within the space of Adam’s B-52 set. It begins with an automated message, presumably generated from Burpelson’s computer room. The camera closes in on the “CRM” receiver on the communications panel. It reads; “FGD 135”. Cut to a crewmember rummaging through a ring binder. 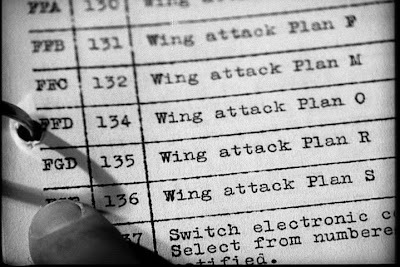 He finds that “FGD 135” corresponds to “Wing Attack Plan R.” After some deliberation whether this is a bonafide message, Major Kong withdraws a book, some text and maps describing “Wing Attack Plan R”: a strike against several ICBM installation in Northern Russia. The scene, though dramatized and fictionalized, was nevertheless remarkable as it rattled the nerves of Air Force officials, who promptly asked that a disclaimer be placed at the beginning of the film. This scene is also remarkable for its depiction of both human and computerized elements operating side by side. And the fact that they mirror each other is even more remarkable: for the launch officers’ rote procedure is very computer-like, and the launch computer’s rote recitation of numbers is very human-like. The similarity between the human and computerized systems no doubt recalls a cybernetic system, an example of a procedure where the human element operates like a machine and vice-versa. However, another consideration of this process reveals something even more fascinating: the notion that the codes are buried inside books – digital, computerized data stored in, and accessed from books. It is hard to imagine a time when the book was not a universal medium, one that, for a short time, remained closed to competition from rival media. Writing about literary and oral culture at the beginning of the 20th century, Kittler writes in Discourse Networks: “Aside from mechanical automatons and toys, there was nothing. The discourse network of 1800 functioned without photographs, gramophones, or cinematographs. Only books could provide serial storage of data.” This situation soon changed, however, and by 1900 the book’s position as the chief storage medium was placed under threat by “new” technologies such as the gramophone, phonograph, and film. Kittler considers each of these in turn, but before doing so looks at the ways in which a more basic technology – the typewriter – transformed practices of writing (and reading), and with this the secondary realm of semantics. Nietzsche’s typewriter (which was bought in 1882 due to the philosopher’s half-blindness) is used as an example to show how this technology transformed the physical connection of the writer to the text through the automation of the writing act: “Whereas handwriting is subject to the eye, a sense that works across distance, the typewriter uses a blind, tactile power”. The typewriter automated the act of writing and with this inscribed itself into the author. Beyond this, it changed the materiality of the text itself by organizing writing spatially through the distribution of discrete rather than continuous signs. This changed “the relations among signs but also their relation to the empty ground” , and with this transformed the meaning and content of the written text. In line with McLuhan, the technology of writing (in this case the typewriter) is thus shown to shape the material form of the text produced, and with this the subsequent possibility of human understanding. Hence, as Nietzsche (who Kittler calls the “first mechanized philosopher” ) observes, while writing on a typewriter: “Our writing materials contribute their part to our thinking.” However, as the example of the codes buried inside books demonstrate, the book is not exactly dead – in the depiction of early Cold War-era warfare, the book is still of paramount importance. All libraries are discourse networks, but all discourse networks are not books. In the second industrial revolution, with its automation of streams of information, the analysis of discourses has yet to exhaust the forms of knowledge and power. Archaeologies of the present must also take into account data storage, transmission, and calculation in technological media. Literary theory can learn from an information theory that has formalized the current state of technical knowledge, and thus made measurable the performance or limits of information systems. After the destruction of the monopoly of writing, it becomes possible to draw up an account of its functioning. This book […] collects, comments upon, and relays passages and text to show how the novelty of technological media inscribed itself into the old paper of books. Many of these papers are old or perhaps even forgotten, but in the founding age of technological media the terror of their novelty was so overwhelming that literature registered it more acutely than in today’s alleged media pluralism, in which anything goes provided it does not disturb the assumption of global dominance by Silicon Valley. An information technology whose monopoly is not coming to an end, however, registers this very information: an aesthetics of terror. What writers astonished by gramophones, films, and typewriters – the first technological media – committed to paper between 1880 and 1920 amounts, therefore, to a ghostly image of our own present as future. Those early and seemingly harmless machines capable of storing and therefore separating sounds, sights, and writing ushered in a technologizing of information that, in retrospect, paced the way for today’s self-recursive stream of numbers. The last historical act of writing may well have been the moment when, in the early seventies, Intel engineers laid out some dozen square meters of blueprint paper (64 square meters, in the case of the later 8086) in order to design the hardware architecture of their first integrated microprocessor. This manual layout of two thousand transistors and their interconnections was then miniaturized to the size of an actual chip, and, by electro-optical machines, written into silicon layers. Finally, this 4004 microprocessor found its place in the new desk calculators of Intel's Japanese customer and our postmodern writing scene began. For the hardware complexity of such microprocessors simply discards manual design techniques; in order to lay out the next computer generation, the engineers, instead of filling out uncountable meters of blueprint paper, have recourse to Computer Aided Design, that is, to the geometrical or autorouting powers of the actual generation. On the other hand, this essay alludes to a much more subtle transition. 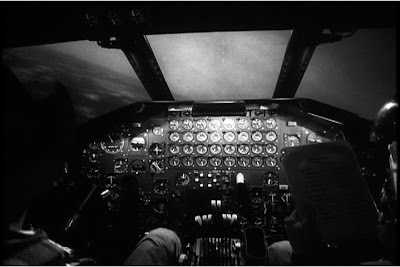 If, as Kittler argues, the transition from visual to oral culture coincides with the dawn of the 19th century, then perhaps the conversion to digital culture becomes the focus of Ken Adam’s sets for Dr. Strangelove. This essay has shown that the interiors of Burpleson Air Force base suggest an important aspect of computing: a Protected Mode that insulates and protects a computer’s own operating system. Two spaces within the base – General Ripper’s office and the computer room – thus feature an interplay of oral command and radio transmission that articulate the tensions between Protected and Real Mode. On the other hand, Adam’s designs for the B-52 crew compartment suggest the impermeability of Protected Mode, and impermeability made more resonant by the spatial configuration that enables it in the first place.